Did any of you eat whoopie pies growing up? Or ding dongs or ho-hos or twinkies? By the way, who came up with those names? Anyways, these whoopie pies are semi-homemade since I cheated and used a box of cake mix (shame on me, I know! ), but they taste incredibly similar to the real thing I ate as a kid. And they took little-to-no time to make! They look like jumbo sized oreos, except the cookie is fluffy and moist, and the filling is sweet and sticky. It kind of reminds me of taking a cupcake, ripping off half of the cake on the bottom and placing it on top of the frosting. So basically turning it into a cupcake sandwich. Do any of you do that? If not, you should try it! Makes cupcakes so much easier to eat and a lot less messy! Back to the whoopie pies. They're delicious, easy and fun. Everything you'd want in a dessert. Plus they're perfect for kids OR adults. You can even switch up the type of cake mix you use for a different flavor combination. Hope you guys enjoy this recipe. Have a fantastic weekend! Combine dry cake mix with oil, water and eggs. Stir until combined. Use an ice cream scoop or two spoons to drop the scoops of dough onto an ungreased cookie sheet 2 inches apart. Bake for about 13 minutes. Cookies should be firm enough to handle, but not overly done and crispy. Cool completely on a wire rack. Meanwhile, beat together the butter and powdered sugar. Add the marshmallow cream and vanilla, blending until smooth. Spoon 1-2 tablespoons of the filling onto the bottom of a cooled cookie. Press the bottom of another cookie on top of the filling to make a sandwich. Repeat with remaining filling and cookies. Store pies between layers of waxed paper in an airtight container and refrigerate for up to 2 days. Hi there! 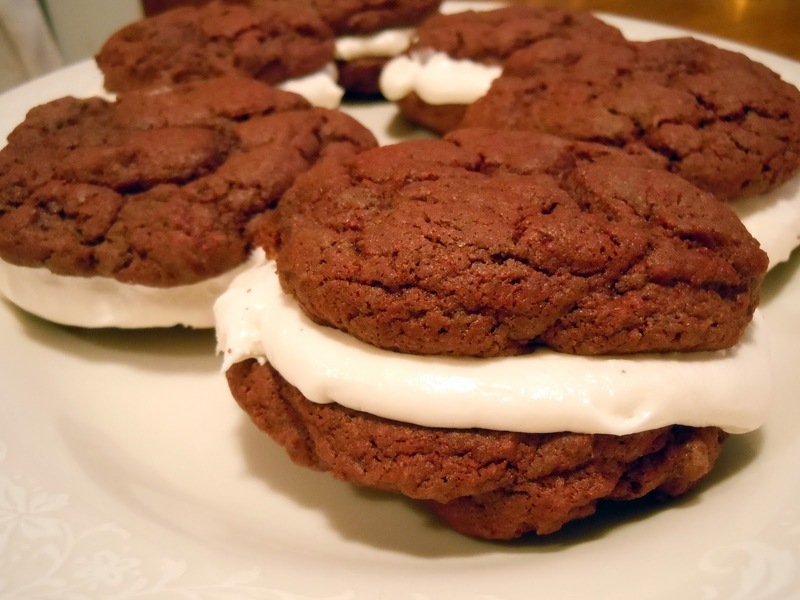 These look so amazing, I love whoopie pies! I think I met your parents over the weekend, they are friends of my parents. Your dad was telling me about your blog so I came by to check it out. Great recipes, I will be following you!